Originally self-released by the artist in May 2018 (and completely sold out following an amazing run of reviews), Mother of Gloom has now been reissued on the excellent Dunedin label Fishrider Records. Fairlight was on the recent SXSW 2019 lineup in Austin, Texas, the same city where this sophomore album was recorded utilising local musicians Cully Symington (Bright Eyes and Okkervil River) andKullen Fuchs, and under the eye of Doug Walseth at The Cat's Eye Studio. Often compared to the likes of Cat Power, PJ Harvey and Natalie Merchant, take Marlon Williams' advice and start with opening track 'Body Below,' which he describes as "an emotionally complex idea, delivered simply in 2 minutes 30 seconds." Tokyo-based singer-songwriter Grant Duncan's new album Radiant Sublime unleashes more catchy indie-pop anthems in the vein of previous album Early Morning Rise. Mixing classic rock elements with an indie feel and heartfelt lyrics with deeply melodic grooves, the former member of The Audio Justice has produced the perfect album to soundtrack your first summer BBQ. Check out the beautifully harmonic No Matter How Much You Might Feel on our New (Zealand) Releases playlist and listen to the full album below. Were you at the Hammersmith Apollo for this one? Our world-renowned folk-comedians performed in London in October last year with the show recorded as an HBO special. Record label Sub Pop have released the show on triple-LP for vinyl junkies, or you can listen to the songs from the show on Spotify. The duo re-visit old BBC classics during the performance and throw in some new tunes to brighten your commute - have a listen and a laugh below. 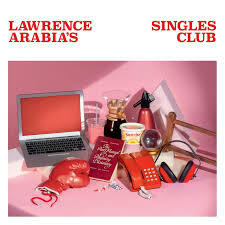 The Singles Club album by brilliant songwriter James Milne, AKA Lawrence Arabia is out now! Having previously won both the APRA Silver Scroll and the Taite Music Prize under the Arabia name, as well as critical acclaim for releases as The Reduction Agents and as a member of The Brunettes and BARB (alongside Connan Mockasin and Liam Finn), Milne started this ambitious project early in 2018. The premise was a single released each month of the year, bringing together the talents of Hollie Fullbrook (Tiny Ruins), Heather Mansfield (Brunettes), Ryan McPhun (Ruby Suns), Liam Finn and Beach Boys collaborator Van Dyke Parks. Al Park has been in and around the Christchurch music scene for over 30 years as musician, promotor, mentor, record store worker...and almost any other music-related role you can think of. Since 2011 he has played a big role in the incredible post-quake music revival and this tribute album celebrates his support of the Garden City's music and musicians. The artists covering his songs on this record have all been supported by Park across the years - from Marlon Williams toDelaney Davidson and Jordan Luck (whose band The Dance Exponents, later The Exponents, featured Park as a pimp in their 1983 video for classic single Victoria). Auckland band OUNCE have built a strong live reputation back in NZ for their intensity and improvisational creativity. Their debut LP Oz is out now on 1:12 Records. The album is described as 'heavy kraut rock grooves, surf influenced guitar and 50s exotica percussion' - order physical copies via NZ's awesome mail order music store Flying Out below. Auckland artist Dave Baxter, better known as AVALANCHE CITY, released his new album titled My Babylon. The indie-folkster took the airwaves by storm in 2011 when Love, Love, Love went to number one in the charts and scooped the covetedAPRA Silver Scroll Award that celebrates the best NZ song-writing performance of the year. His 2018 single Prayed for Love was his first release in three years - listen to the new album below. Folk ensemble PAPER CRANES 折り鶴 released the follow up to 2015's album The Road Home earlier this month. The latest offering is lighter than its predecessor, with a melancholy warmth spread through the music while lyrically staying true to themes of life, love and death previously explored. Listen to Voices below. Post-punk shoe-gazers BEAT RHYTHM FASHION are back after a three decade hiatus with an album of new material on seminal Kiwi record label Failsafe Records. Nino Birch, Caroline Easther (ex-Chills) and Rob Mayes return with an album of the same kind of dreamy pop tunes that dominated Wellington's Terrace scene in the late 1970s and early 1980s. Stream and buy the album below. Diverse, genre-spanning Kiwi supergroup L.A.B released the follow up to 2017's debut self-titled album at the end of last year and it's another journey through Pacific-style sound. Two members of popular band Kora, the bass player from live heavyweights Katchafire and bluesy vocalist Joel Shadbolt combine to create a sound of their own, with roots in reggae, electronica, funk and rock. Listen below. The debut album by Christchurch lo-fi bedroom popster PICKLE DARLING, aka Lukas Buda, is a pure gem. Sweet, sad, funny, tragic...each tune is filled with clever lyrics reportedly recorded in a single take. The follow up to last year's Bandcamp bestselling EP Spring Onion Pancakes is going to take some beating for my album of the year...and it's only February! Stream it, buy the cassette, pre-order the vinyl, just get into it. Formed in 1986 and long regarded internationally as one of noise rock's leading exponents, Dunedin trio THE DEAD C celebrated their latest release with a rare appearance during Laneway Festival in Auckland in January. According to the press kit their 17th album and sixth for Ba Da Bing! records is apparently 'disguised as the meandering outpourings of vacant thought and activity dialled simultaneously from zero and ten.' I'm unsure about that, but it is definitely full of the distortion, experimentation and improv we've come to expect, with just 3 tracks spread over 40 minutes. Have a listen below. Indie-pop duo BROODS are back with their third album, featuring a very loaded title. Thrust into stardom following smash hits Bridges and Mother & Father from album Evergreen in 2014, the Nelson siblings were signed to a major record label and wore expectations of pop greatness. Then the wheels fell off as they self-admittedly lost control of their direction on the follow up album, which disappointed and ended their Capitol Records connection. Hence the title of the new album and the return of infectious singles such as Peach - have a listen to the album below. The third album by brilliant folkster Holly Fullbrook and her Tiny Ruins band is out now. A full year in the making and recorded at the same studio (Auckland's The Lab) as 2014's wonderful Brightly Painted One, new release Olympic Girls sees band member Tom Healy taking on production duties. If singles School of Design, How Much, Hologram and the title track are anything to go by this album will be a big hit both at home and over here. Recent APRA Silver Scroll winner Marlon Williams recently completed a 60 date world tour in support of album Make Way For Love including a one-off London gig back in October. What better way to celebrate than to release a live album bringing together highlights from his back catalogue? This is a stunning performance and setlist worthy of a live release - if you missed his show last year you will not miss his next visit after you listen to this album. Exciting news for fans of classic Kiwi jangly guitar music - there is a new album out by Look Blue Go Purple member Francisca Griffin(known as Kathy Bull during LBGP's legendary Flying Nun days). The Spaces Between is the follow up to 1998 album Some From The Sky, Bull's debut solo album and first recorded under the Griffin moniker following the demise of Cyclops in the early 1990s.